"On Christmas Eve and Christmas Day 1945, 20 hours of continuous snowfall blocked roads and required snowplow operators to work the holiday in southern Minnesota." But they don't tell the true story. Not the whole story. Picture it. A small town in southern Minnesota, Christmas Eve, 1945. It wasn't like now, where you can order everything under the sun with just a click of your mouse. No, in 1945 if you wanted something you had to go to a store, so near everyone in town was out that fateful day. These rolls bloom in the oven into charming little fans, each with its own look. The bread dough is simple to make and shaping the rolls is quick, easy and (happily for small hands) not an exact science. You can substitute almost any other savory herb for rosemary, though fresh herbs really do work best for this. Put the water, yeast, whole wheat flour, three cups of the bread flour and the olive oil in a large mixing bowl and stir to combine. (Use low speed on a stand mixer.) Sprinkle in the last cup of flour while mixing, stopping when the dough clears the bowl and stops absorbing flour. Cover the bowl and let the dough rest for 20 minutes. When the dough has doubled in size, turn it out on a lightly floured counter and flatten into a rectangle with your hands. Let the dough relax for a minute while you prepare a muffin tin by lightly coating each cup with olive oil. Using a rolling pin, roll the dough into a 12x18 rectangle. If the dough starts resisting and springing back, let it rest for a few minutes and then finish rolling. Brush the dough with olive oil or melted butter and sprinkle liberally with chopped rosemary. Cut dough in half crosswise and lay one piece on top of the other. Cut that stack in half and stack the pieces to make one four-layer stack that's about 6x9 inches in size. Make three cuts crosswise and 4 lengthwise to give you 12 rolls about 1 ½ by 3 inches. It doesn't matters if the sides are uneven, it's what gives them their charm. Place in oiled muffin tins, one stack per cup with a short edge facing up. Cover and let rise until doubled in bulk, about an hour. When the rolls have increased in size by about half that amount, turn on the oven to 425 to preheat. Bake for 25 minutes, until golden brown. Cool in pans for 15 minutes and then gently turn them out onto a rack to finish cooling. Don't handle the rolls too roughly; they occasionally fall apart when warm. I was chuffed when More asked me to contribute a recipe to their Best-loved Christmas Recipes article. The Rosemary Fan recipe they posted is a simpler version of these Rosemary Fans — which uses a starter and has step-by-step photos if you find them helpful. the Venn diagram of kitchenMage. There was this day that PETA annoyed me: Dear PETA, women are animals too. I hang out on twitter. Follow me there and join the fun. The crumb, sadly, did not. Dense and chewy, not tender and light. Totally wrong. Bûche de Noël: It's done! Well it isn't the world's best picture and I went for simple decorations, but here it is. 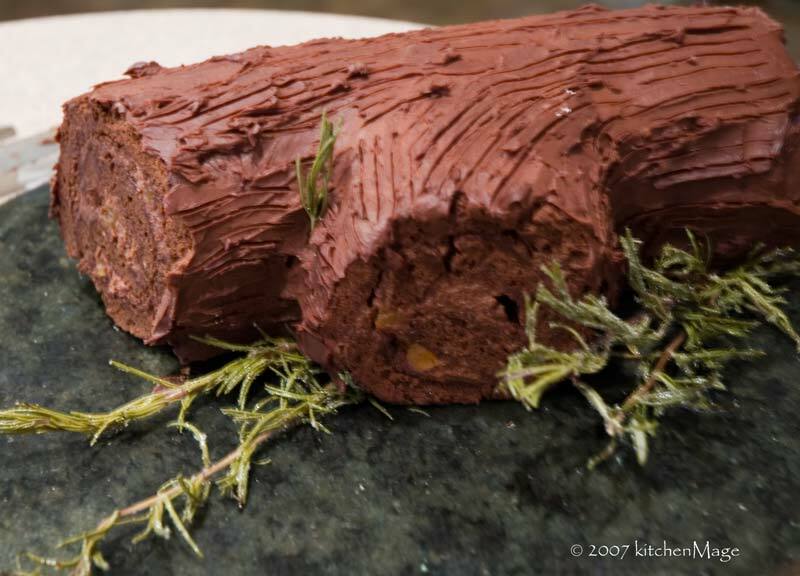 A minimalist Bûche de Noël with candied rosemary sprigs. The weather report says there may be snow before it is served. 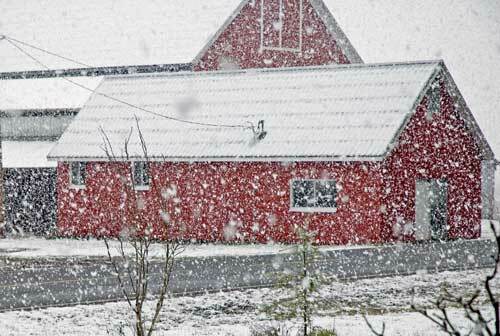 But what do the weather folks know, they predicted mushrooms! Merry Christmas (if you do that) and Happy Tuesday (if you don't) - see you all in a day or so with the rest of the photos of the madness. I'd love to sit and chat but I have a cake to frost. With this. Cake is on the counter, rolled in a towel, the photos are in the camera and I still have to start the mushroom meringue. I also decided that candied rosemary sprigs would look very pretty. Because. I. Am. Crazy. Beat 3 egg whites until foamy and slowly sprinkle in 3/4 cup powdered sugar. Beat to billowy, stiff peaks. Dice a handful of dried apricots, splash with amaretto and set aside for 30 min. Gently fold 1/3 of meringue into the sweet chocolatey butter. Repeat with other 2 thirds. Add apricots and mix in gently. 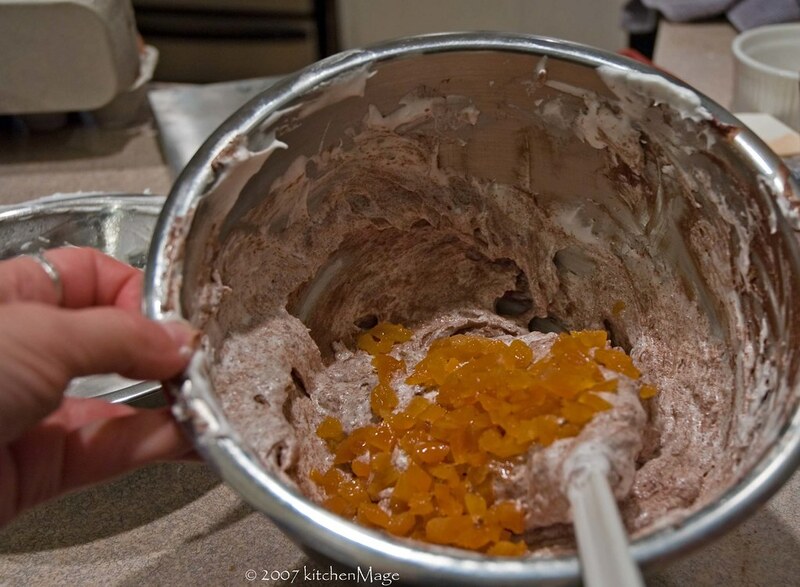 refrigerate until cake goes into oven, then set on counter to soften. If you are anything like me, you are just starting a rather complicated dessert and have no time for blogs...and therefore you probably aren't reading this. Maybe I need another lede.